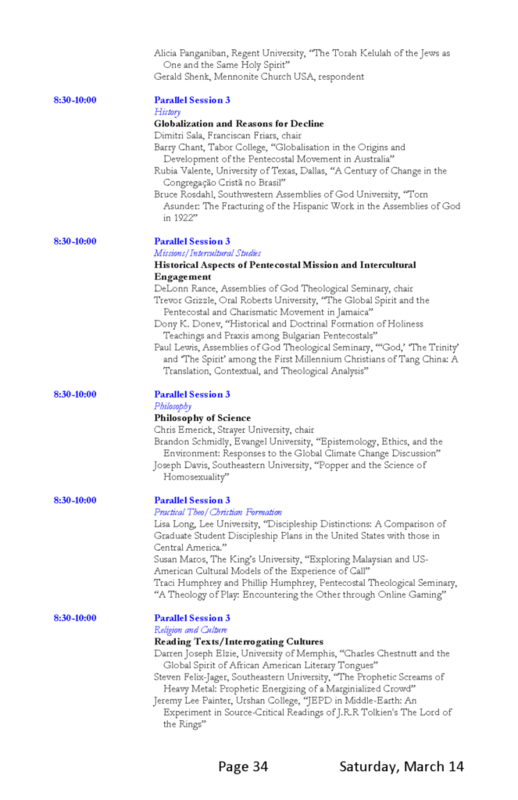 Why I Decided to Publish Pentecostal Primitivism? By Cecil M. Robeck, Jr.
For years, the building on Azusa Street has also been an enigma. Most people are familiar with the same three or four photographs that have been published and republished through the years. They show a rectangular, boxy, wood frame structure that was 40 feet by 60 feet and desperately in need of repair. Seymour began his meetings in the Mission on April 15, 1906. A work crew set up a pulpit made from a wooden box used for shipping shoes from the manufacturer to stores. The pulpit sat in the center of the room. A piece of cotton cloth covered its top. Osterberg built an altar with donated lumber that ran between two chairs. Space was left open for seekers. Bartleman sketched seating as nothing more than a few long planks set on nail kegs and a ragtag collection of old chairs. What the new sources have revealed about the Mission, however, is fascinating. The people worshiped on the ground level — a dirt floor, on which straw and sawdust were scattered. The walls were never finished, but the people whitewashed the rough-cut lumber. Near the door hung a mailbox into which tithes and offerings were placed since they did not take offerings at the Mission. A sign greeted visitors with vivid green letters. It read “Mene, Mene, Tekel, Upharsin” (Daniel 5:25, kjv), with its Ns written backwards and its Ss upside down. Men hung their hats on exposed overhead rafters where a single row of incandescent lights ran the length of the room. A series of maps drawn by the Sanborn Insurance Company give a clear picture of the neighborhood. 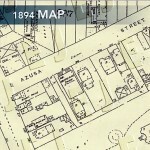 The 1888 map discloses that Azusa Street was originally Old Second Street. The street was never more than one block in length. It ended at a street paving company with piles of coal, along with heavy equipment. A small house, marked on the map by a “D” for domicile, sat on the front of the property with the address of 87. (See highlighted section.) A marble works business specializing in tombstones stood on the southeast corner of Azusa Street and San Pedro. Orange and grapefruit orchards surrounded the property. On the right of the map a Southern Pacific railroad spur is clearly visible. The City Directory indicates that the neighborhood was predominantly Jewish, though other names were mixed among them. 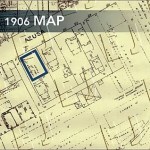 A second map of the property was published in 1894. Old Second Street had become Azusa Street, and the address had been changed to 312. The house had been moved further back on the property where it served as a parsonage. The dominant building at 312 Azusa Street was the Stevens African Methodist Episcopal Church. At the front of the building a series of tiny parallel lines on the map mark a staircase that stood at the north end of the building providing entry to the second floor, the original sanctuary. The only known photograph of the church from this period shows three interesting features. First, it shows the original staircase. Second, and less obvious, the original roofline had a steep pitch. Third, three gothic style windows with tracery lines adorned the front wall. By 1894, the citrus groves had largely disappeared. On the southern side they were replaced by lawn. The smell of orange blossoms and the serenity of the orchard were rapidly being replaced by the banging of railroad cars and the smell of new lumber. A growing number of boarding houses and small businesses, including canneries and laundries, were moving into the immediate area by this time. 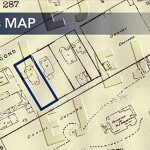 The property marked “YARD” on the map is the beginning of the lumberyard that soon came to dominate the area. The City Directory reveals fewer Jewish names, and more racial and ethnic diversity in the neighborhood, including African Americans, Germans, Scandinavians, and Japanese. Stevens AME Church occupied the building at 312 Azusa Street until February 1904 when the congregation dedicated a new brick facility at the corner of 8th and Towne and changed their name to First AME Church. Before the congregation could decide what to do with the property on Azusa Street, however, an arsonist set the vacant church building on fire. The structure was greatly weakened, and the roof was completely destroyed. The congregation decided to turn the building into a tenement house. They subdivided the former second-floor sanctuary into several rooms separated by a long hallway that ran the length of the building. The stairs were removed from the front of the building and a rear stairwell was constructed, leaving the original entry hanging in space. The lower level was used to house horses and to store building supplies, including lumber and nails. In 1906, a new Sanborn Map was published. (See 1906 map.) The building was marked with the words “Lodgings 2nd, Hall 1st, CHEAP.” The transition of the neighborhood had continued. The marble work still occupied the southeast corner of Azusa Street and San Pedro, but a livery and feed supply store now dominated the northeast corner. A growing lumberyard to the south and east of the property now replaced the once sprawling lawn. A Southern Pacific railroad spur curved through the lumberyard to service this business. The Apostolic Faith, the newspaper of the Azusa Street Mission between September 1906 and June 1908, later referred to the nearby Russian community. Many of these recent immigrants were employed in the lumberyard. They were not Russian Orthodox Christians as one might guess; they were Molokans — “Milk drinkers.” This group had been influenced by some of the 16th-century Reformers. 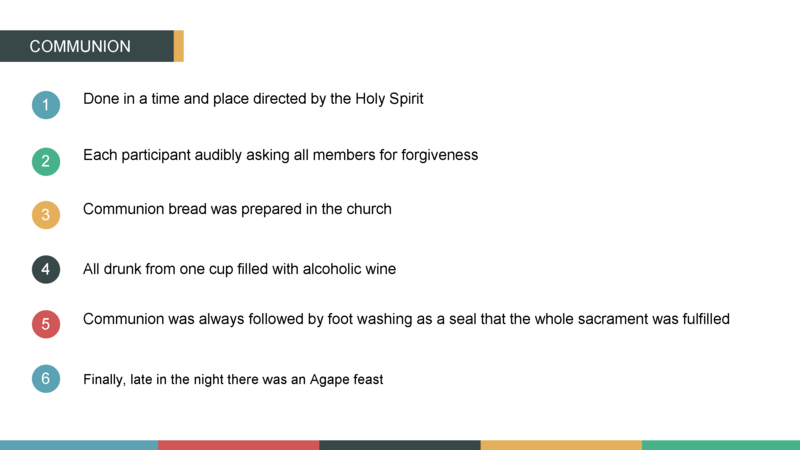 They did not accept the dairy fasts of the Orthodox Church. They were Trinitarians who strongly believed in the ongoing guidance of the Holy Spirit. 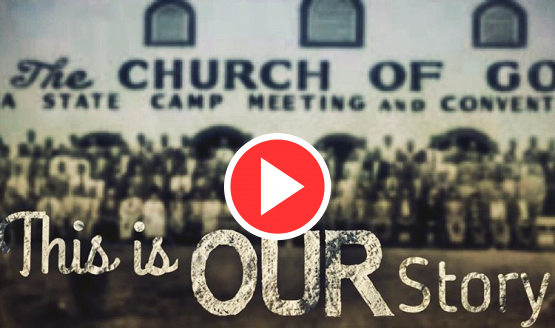 Demos Shakarian, grandfather of the founder of Full Gospel Business Men’s International, was among these immigrants who were led to Los Angeles through a prophetic word given in 1855. Henry McGowan, later an Assemblies of God pastor in Pasadena, was a member of the Holiness Church at the time. He was employed as a teamster. He timed his arrival at the nearby lumberyard so he could visit the Mission during its afternoon services. This map suggests why some viewed the Mission as being in a slum. A better description would be an area of developing light industry. In April 1906, when the people who had been meeting at the house at 214 North Bonnie Brae Street were forced to move, they found the building at 312 Azusa Street was for sale. The photograph below taken about the time that the congregation chose to move into the building shows the “For Sale” sign posted high on the east wall of the building, as well as the rear of the tombstone shop. Seymour, pastor of the Azusa Street Mission, and a few trusted friends met with the pastor of First AME Church and negotiated a lease for $8 a month. An early photograph reveals what the 1906 version of the map indicates. The pitched roof had not been replaced. The building had a flat roof. The staircase that had stood at the front of the building had been removed. In a sense, this building suited the Azusa Street faithful. They were not accustomed to luxury. They were willing to meet in the stable portion of the building. The upstairs could be used for prayer rooms, church offices, and a home for Pastor Seymour. Articles of incorporation were filed with the state of California on March 9, 1907, and amended May 19, 1914. The church negotiated the purchase of the property for $15,000 with $4,000 down. It was given the necessary cash to retire the mortgage in 1908. The sale was recorded by the County of Los Angeles on April 12, 1908. In conclusion, it must be noted that like many other places around the world, Bulgarian Pentecostalism began and continues to be in the periphery of both social and religious life. 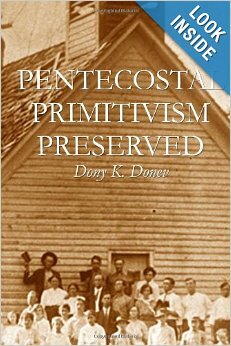 The movement has been persecuted as new, extreme, outcast and even satanic, but in the end Pentecostalism prevailed from the periphery. The only problem with holding strong in the periphery of society is that you spend all your money, all your time, all your motivation, everything you have to change the center – to change reality itself. It demands an extreme internal passion to continue and to become a movement of social influence. For the external observer this makes no sense. The time and resources spent could be so much helpful somewhere else. Perhaps, in an environment that is more suitable for the center – more controlled by the center. And an environment that does not make the center look bad. But when this environment is not the center itself, then the periphery becomes a public enemy to the centralized society and is discarded as crazy, obscene and even inhumane. To the point that after giving it all, you start to feel like it was all spent for nothing. Then you get back to the mission that is more important than our feelings or emotions and convince yourself with all you have left, that the end result is worthy. And then one day you wake up in the center of reality. Even more, you become the center of reality. 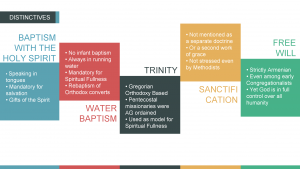 The sacrament of water baptism was not new for Bulgarian believers. 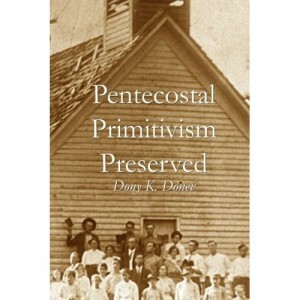 But Pentecostals did NOT accept infant baptism. 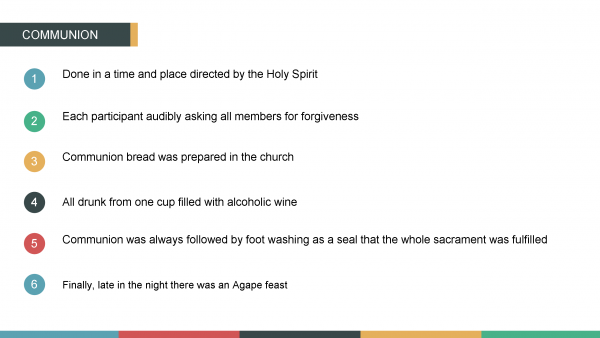 Converts who were baptized as babies or any other Eastern Orthodox ritual were re-baptized before being received in the church. Among early Bulgarian Pentecostals, baptism was always done outside in “running water.” It was also considered mandatory for salvation as Bulgaria’s early Pentecostals insisted on spiritual fullness including: (1) salvation, (2) water baptism and (3) baptism with the Spirit. This formula of spiritual experience satisfied the witness of blood, water and Spirit (1 Jn. 5:8) on earth and corresponded with the triune God in heaven (1 Jn. 5:7), from whom the believer’s spiritual experience originated. Protestant work in Bulgaria began in 1815 when agents of British and Foreign Bible Society, Robert Pinkerton (1780-1859) and Benjamin Barker (d.1859), initiated a search for Bible translators in the spoken Bulgarian vernacular. 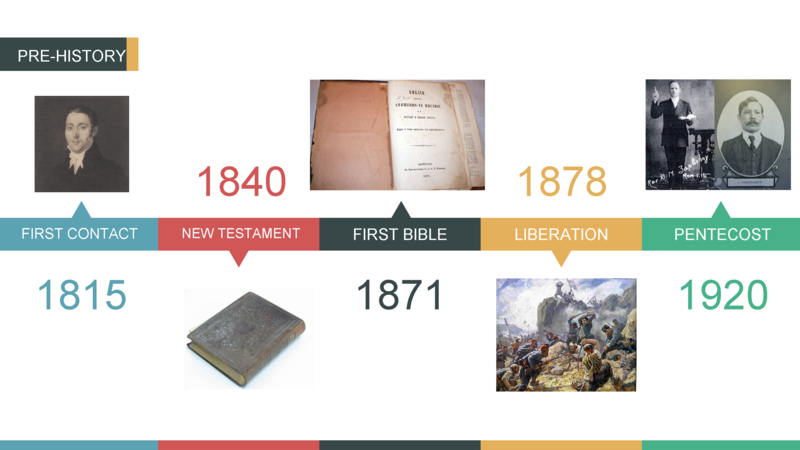 As a result a new translation of the New Testament in Bulgaria was published in 1840 and the whole Bible in 1871. By the liberation of Bulgaria from Turkish Yoke in 1878 Protestantism was well established in Bulgaria. Graduates from Protestant Robert’s College became prominent politicians in the new Bulgarian state. When the first Pentecostal missionaries arrived in 1920, they found a century old protestant tradition in Bulgaria.